The deck in our backyard has needed a makeover since we moved into our house almost 9 years ago. 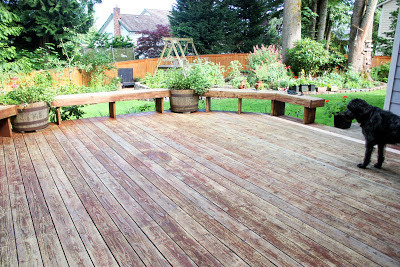 The size of the deck is great and the stain was probably beautiful at some point in the past. Over the years of rain, kids, wear, and dogs, it has seen better days. The deck itself is in fairly good shape, with just a few boards that needed replacing, but the stain really needed some TLC. We have a fairly large deck. The photo below only shows a portion of it. The deck also wraps around the back of the house. It’s a lot of space, and I’ve always been reluctant to tackle it. Well, when the weather man called for a full week of dry weather, I knew I had to jump on it! We started by pressure washing the whole thing and replacing a few boards. My sister owns the truck in the family, so whenever I need dirt, sod, lumber, or furniture, I call her. So, after her run one day, she stopped by to pick me up and take me to our local lumber store. As we were standing in line, the man in front of us finished up his order and the salesperson said, “It’s just so refreshing when someone actually knows how to order lumber.” At that point we both burst out laughing! You can only image how unimpressed he was with us! Oh, and we had to go back twice because I ordered the wrong thing the first time. My sister’s such a good sport! Once it was clean and pressure washed, we had to wait a few days for it to dry out. 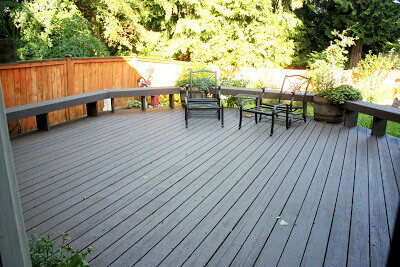 We used a new product called Behr DeckOver. Hindsight, I wish I would have contacted Behr first and asked if they’d like to sponsor this little project. It has been the talk of the cul-de-sac and also the talk of my recent backyard party. It seems everyone is ready for a little deck update and they are all very interested in my opinions of this product. Oh, well. Hind sight is always 20/20. So, for this project we started with 4 cans of DeckOver, which I thought would be plenty. Turns out we needed 6 cans. It was $34 per can at Home Depot, with a $5 rebate per can. We started with all of the hard parts like benches, skirting on the deck, and underneath the benches. Then we moved on to cracks and crevices. You can actually use the DeckOver to fill in cracks, which is pretty cool. It’s also pretty time consuming, so I didn’t do too many areas. Once we started with the rolling, it went pretty quickly. We ended up doing three coats because after the second coat, when I was touching up a few spots, the paint didn’t dry evenly and it really bugged my hubby. I think I could have lived with it, but I know it would have driven him nuts. Yes, I love him enough to re-roll the entire thing! It took several more hours, but I think it looks great. 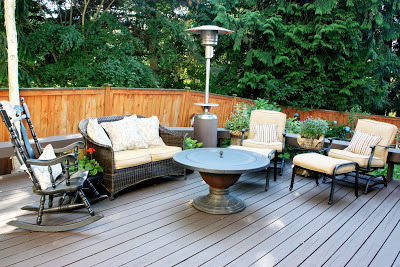 Here’s the deck with the outdoor furniture on it. By the way, it comes in 54 colors. This one looked the best with our house color and furniture. It’s called Coffee. Whew! That was a big job. I think my deck chairs are calling my name. I’ll let you know how DeckOver holds up to dogs, kids, and parties. For now, I’ll be resting and nursing my injuries on the new deck. Apparently pressure washers get really hot, and I have two large burns on my leg to prove it. I also have multiple blisters from spending so much time with a roller and paint brush in my hand. Oh, and I fell in the window when I was trying to get off the roof after washing the skylights. I had to wash the skylight before I painted the deck because I didn’t want to get the new deck wet and dirty. There you have it. That’s why I’ll be on the deck chairs nursing my injuries. 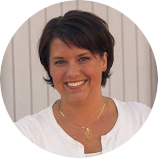 Hi, I was wondering if you've had any problem with peeling or scratching on your deck with the deckover? It's a lovely space with an airy and relaxing atmosphere because of those trees and plants around. 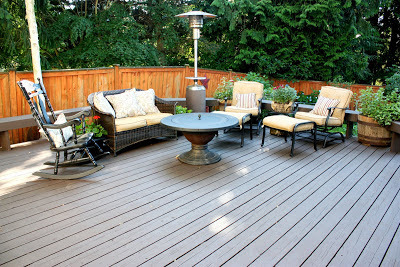 Your deck is pretty big, which is good for a barbecue party or dinner with friends and family. The furniture choices are great too. 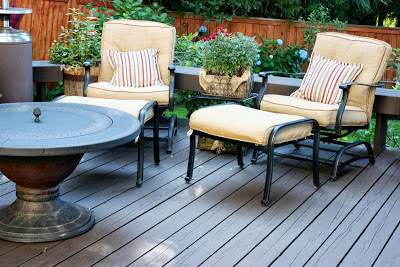 It sets a good mood to the overall look of the deck. Well, at least you have something to show for those injuries. The deck looks amazing! And it really goes well with the darker furniture. The light-colored cushions and pillows are a nice touch too.